And just like that, the first month of the year is already on its way out making room for February. Let it be known that for many Maltese and Gozitan people, the word February conjures up one specific image in their minds: Carnival! A full week bursting with events, colours and downright madness- yes even madness. Here are some fun facts throwing light on one of the most highly anticipated events on the islands. 1. THOUSANDS OF MALTESE CROSS OVER TO GOZO FOR CARNIVAL WEEKEND! Around 43,000 to be precise! This is an established tradition which has been growing considerably stronger over the years with Gozo becoming completely booked out during the weekend. As it happens, the Gozitan roads get busier, the ferry service works round the clock to cope with the crowds and the whole island throbs with a life and a contagious energy that is young and vivacious. Without any shadow of a doubt, this is one of the main reasons why so many locals flock in the thousands. As the last rays of sunlight start to fade away, many are those seen lurking in Nadur's main streets with masked faces and grotesque costumes. These participants go to great lengths to contort their appearance, resorting to quite literally anything which comes to mind, or rather anything which they manage to get their hands on. One really has to appreciate both the effort and the creativeness. Essentially, this is exactly what Carnival in Gozo has become synonymous with. You will also notice several self-made floats passing through the impenetrable crowds blaring tasteless music and sporting scribbled messages on the sides. If you're a tourist, this may be a good thing. Assuming you were able to grasp what these messages convey, there is a very good chance you may end up getting insulted. This would be a good moment to take life with a pinch of salt (or a handful) - it's all part of the game. Speaking of floats, many float competitions also take place across Malta in Floriana and Gozo in Victoria. These mechanically powered floats are mostly fashioned from cardboard and are creatively painted in a whole riot of colours, sometimes even towering to a staggering height of seven meters. That's a lot of cardboard to be sourced, cut out, pieced together and eventually painted on! No wonder these dedicated float companies start their artistic works a year in advance. These massive floats are usually accompanied by an army of dancers, each parading extravagantly designed costumes. 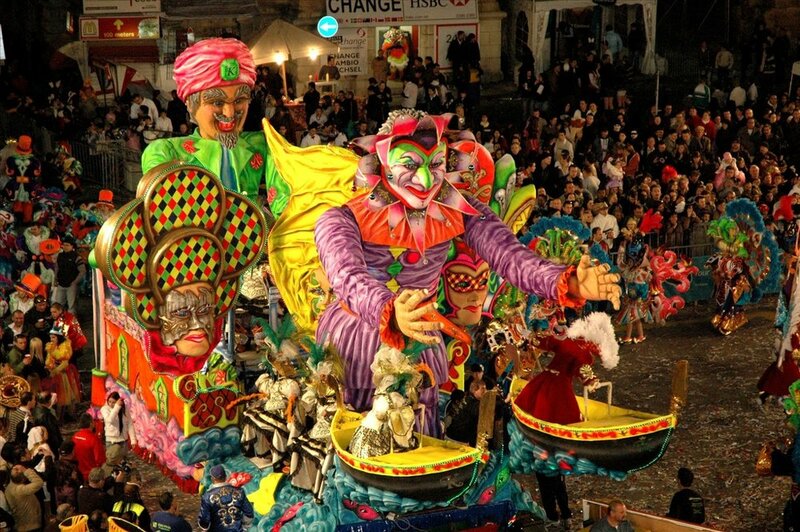 The fervour of Carnival radiates into all the Gozitan villages, each celebrating Carnival in their own version. For instance, Xaghra village has amiably managed to keep alive a precious traditional folk dance that has been passed down for many generations. This special dance goes back as far as the 1890s. Thanks to Ghaqda Kumittiva Ghawdex, we can still see it being performed today during Carnival period! 5. THERE'S ALWAYS ROOM FOR DESSERT... ESPECIALLY CARNIVAL DESSERT! Similar to other Mediterranean countries, Maltese desserts are usually void of chocolate. However, let it not be said that our desserts are bland! Sampling Carnival sweets such as a prinjolata or perlini will definitely persuade you. 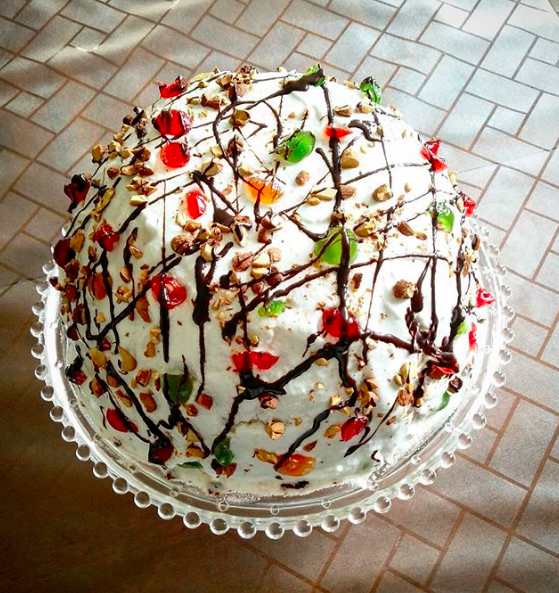 Prinjolata is a dome-shaped cake made from a delicious mix of almonds, biscuit and citrus fruits, topped with cream and pine nuts. In the old Carnival days, perlini used to be thrown gracefully from atop the floats. These are sugar-coated almonds coming in all sorts of pastel colours. You can find both of these delights from most shops.